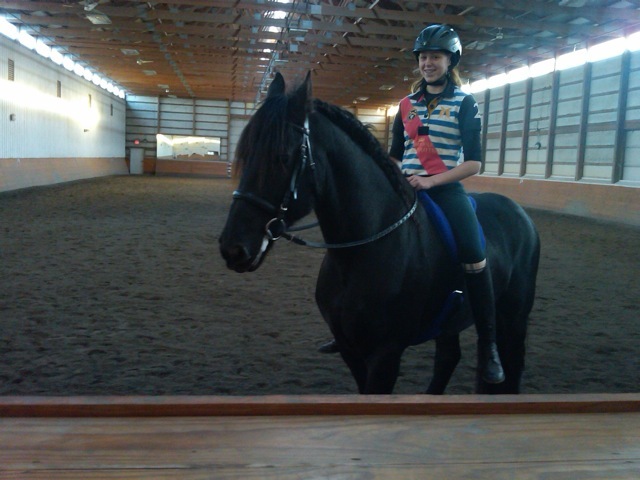 Riding Arenas: There are two arenas at Harmony Hills. We have an outdoor, fenced in, arena (200′ “x 60′). Much time and effort had been put into creating the base of all limestone areas (arenas, paddocks, stall base) with the advice of Footings Unlimited. The outdoor has this base covered by 2 +” sand. 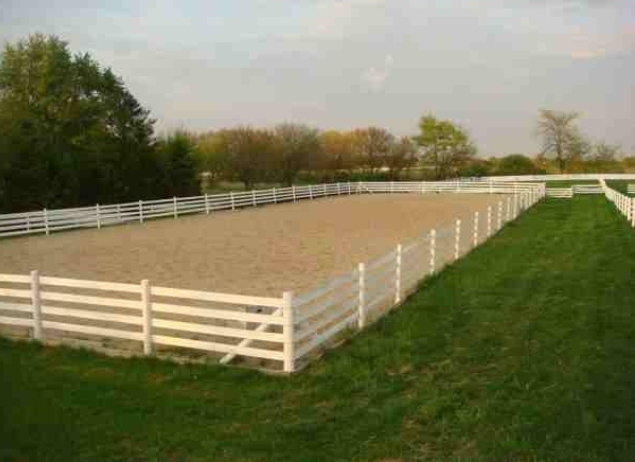 The indoor arena (180′ x 60′) also has the limestone base and is covered with a product of virgin rubber, sand and cotton from Footings Unlimited. The indoor arena also has angled side stirrup walls, sprinkler system, mirrors, and a protected area for viewing in the arena. The copula (exhaust) fan provides much relief of heat in the summer, pulling the air up and out. There are also 24 individual fans in the arena ceiling. Two 4′ x 30′ sliding windows open up to fresh air and a nice view with a breeze! Tack Room: Each horse is provided with a tack closet which contains a saddle rack, a couple of shelves and hooks. 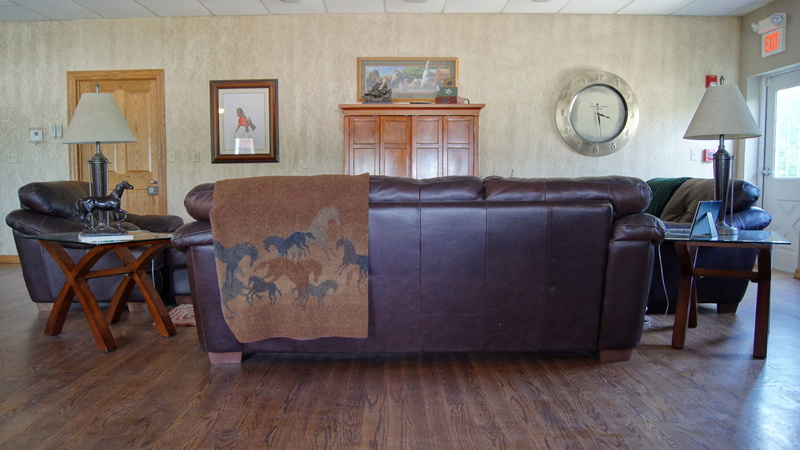 The tack room and the stall barn are heated with radiant heat flooring to a temperature of about 42 degrees. This is recommended so the horses don’t have too drastic of a change in the temperature during the winter and don’t need to be blanketed inside. When the tack room and bathroom doors are kept closed they are much warmer. Laundry Facilities: If you would rather not take your dirty horse laundry home, a coin operated washer and dryer are available with detergent provided. Clubroom: We are a family friendly facility! 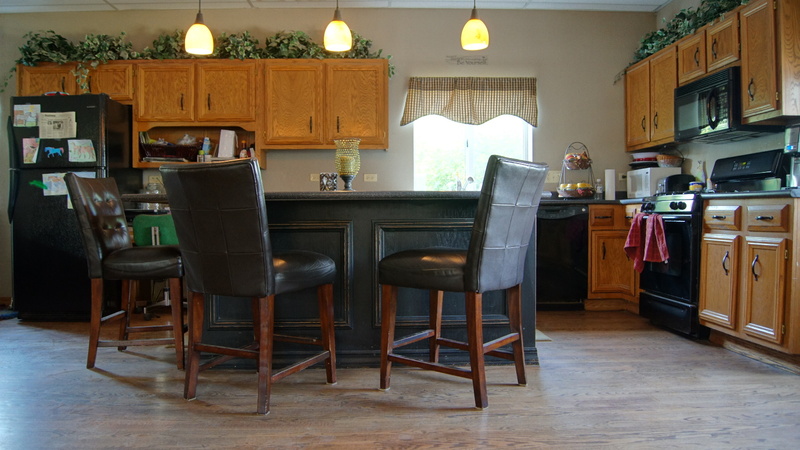 Our clubroom has a full kitchen with island and seating. There’s also an area with a flat screen TV for our significant others who want to come support us but may also need to be entertained watching golf or a football game! Siblings may need to be entertained in the heated clubroom while you are still able to watch your rider thru the 3 large viewing windows into the arena. Please note that children may not be left unattended. Security: The property is wired to the police and fire department in the event of an emergency, and hay is stored in a separate building. Horse Wash Stall: A wash area is available for the horses with hot and cold water, crossties and a rubber mat. Bridal Path: A fenced-in bridle path area is located on the back half of the property. Many like to cool down their horses after a ride or even incorporate the area into their training.